The Annual Years by Paul Magrs book review. Author Paul Magrs says in the introduction to this tome (subtitle: A Celebration Of The World Distributors Doctor Who Annuals ), “These extraordinary books are like weird, grotesque shadow-versions of the show we recognise… The world of the annuals is odder, darker, madder, more psychedelic and surreal. These are adventures in a wilder, destabilised universe.” It’s a tantalising opening flourish, so what a shame that the book doesn’t quite live up to this foreword and make its subject truly come alive once more. What would you want in a comprehensive overview of the regular Christmas pressie that thousands of young Who fans woke up to between 1965 and 1985? Here's a guess: interviews with the creators; a critical look at the features and strips; placement of the annuals in the TV show’s timeline; various tasty titbits about the books and their creation. Yes? Well, Paul Magrs – who has penned a number of Doctor Who novels and audio adventures – gives us a little bit of all of these things, but very much places the emphasis on analysing the books’ fiction, which largely came in the shape of text stories (making many a youngster groan), along with some picture strips. And when we say analysing we mean, by and large, quite detailed synopses, unfortunately. Does anyone still like reading these kind of plot breakdowns? Brief ones are excusable, but long ones like these feel eminently skippable. And these are not stories that necessarily deserve detailed appraisement: as the critical consensus has it, the standard of storytelling was generally pretty low. Magrs is guilty of overrating and over-analysing the work, which, as he admits, was done in a rush on a small budget. Time after time this is the case. Writing about the 1979 annual, for example, he says: “Leela’s speech becomes a little formal – she describes a new planet as ‘First rate’ – which makes me wonder if she’s aping the Doctor’s vernacular, or whether it’s just a mistake.” Yep, it’ll be a mistake – or at least, another example of non-TV writers dashing off their piece in a hurry because of a tight deadline. This stuff really doesn't warrant this level of analysis. Take this example from his write-up of the 1978 publication: “’The Sea Of Faces’ has more of those glorious moments in which the Doctor doubts himself. Presumably he’s still rattled from the mistakes he made in ‘The Traitor’ [a previous story in the annual].” No, don’t presume that, because it’s almost certainly not the case; inter-story continuity in an annual was rare. He also attaches too much import to perceived common ground with the television programme. He says of a story in the 1982 annual: “When [the Doctor] turns overnight into his Fifth incarnation, no one mentions it.” Well, of course they wouldn’t, not here. Then there’s this on the 1980 annual: “Sarah’s gone, Leela’s gone – and now here’s Romana. No mention is made of why the switch in ladies; and no allusion is made to the Key to Time.” Again, you’d never expect that in the annuals, created with only vague knowledge of what would be going on in the TV show and with very early print deadlines – as Magrs knows. Discussing the 1978 annual he writes: “We are in a separate timeline, in which Dr Who and Sarah Jane Smith travelled together for longer, and into further distant galaxies.” Why adopt that analysis for that annual, and not for the others?! Magrs also often talks about the annuals’ characterisation of the Doctor in-depth, as if it was incredibly significant. It wasn’t, really. Yes, it’s good that he takes his subject seriously, but there are limits. 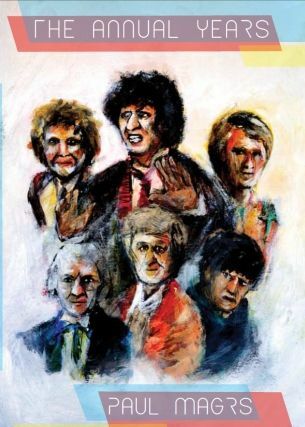 Following the synopses, the author has a number of headings under which he discusses each annual, such as “Doctor Who Himself”, “TV Feedback”, “Anticipating The Future”, “Classic Moments” and “What I Learned”. These are more readable than what precedes them. But more research into the making of the annuals would have been welcome. Of the picture strip in the 1981 annual he says: “This is much more rudimentary work, aimed at a much younger audience. It’s hard to tell if this is a result of an order from the BBC.” It would have been interesting to find out for sure. Similarly when he writes of the 1974 annual, “The artwork seems to be the product of several different hands", is that correct? If so, whose? There are also a few out-of-the-blue sentences which just strike you as odd, such as “I wonder if 1979 proves to be a high-point for the series?”, or this comment on a panel in the 1977 annual: “The Doctor himself is so surprised and excited by what he sees projected upon the eye spider brain screen that he ejaculates, apparently.” Sorry?! Of the ’76 annual, he writes: "This gives the story a thrilling, dreamlike quality, entirely fitting for the curious year of 1976.” Why was it a curious year? Personally for the author, or for the world as a whole? We’re not told. Then there's: “The Fourth Doctor’s life in the annuals is the longest, just as it was on TV.” Well, yes, obviously. Besides discussion of the 20 Doctor Who annuals, there are also chapters on 1966 storybook Doctor Who And The Invasion From Space , 1976 Typhoo Tea book The Amazing World Of Doctor Who , the 1983 K-9 And Company annual (which gets way too much space) and two '80s omnibuses, Adventures In Time And Space and Journey Through Time ; the five Dalek annuals are not covered. The book’s crying out for discussion on much more than the actual stories. Why not comment on the sometimes bizarre, sometimes fun games and puzzles? Why not talk about the science articles; how some of them got it wrong and some of them were prescient? Magrs barely even mentions a single cover - covers which were often glorious, occasionally duff, but were always, naturally, important. There isn’t even the anecdote about artist Paul Crompton’s fondness for real ale, which apparently led to his demented illustrations in the late '70s annuals! Just as the intro to the book is quite interesting – and the first chapter, “The Making Of Doctor Who”, is a hugely enjoyable and informative read – so are the closing chapters which follow the annual-by-annual discussions. To a point. “A New Life” touches on the post- World Distributors annuals, including Marvel’s '90s efforts and the return of the official product with the Russell T Davies era. But that’s all it does, touch on them – the chapter is very brief, and again you’re left crying out for more. Then comes “Interviews"; “At last! ", you think. But while these discussions with five of the creators of the annuals are okay, they’re badly in need of a thorough edit and might have been more welcome if included in the relevant section on the annuals they worked on. The interview with artist Stanley Freeman, however, does at least throw up the surprising information that for all these years Walt Howarth has been wrongly credited with illustrating the cover of the first William Hartnell annual. Another interesting thing mentioned is how, before Hartnell gave way to Troughton, it was seemingly taken for granted by the BBC and World Distributors that the lead actor would indeed be replaced. This casts the show’s production in a slightly different light. But all this is too little too late. The Annual Years is a missed opportunity. It’s often too wordy and it doesn’t do enough to place the annuals in the context of the popular culture of the times, or indeed what the TV show was during these times. There isn’t enough general critical analysis. The author will claim that it was his intention to mainly focus on the annuals’ fiction, but there's so much more to talk about. Graced with a truly appalling cover, and devoid of illustrations from the works being discussed (because of rights issues, no doubt), this is a book you desperately want to like but struggle to – a bit like a lot of the annuals that it covers.